I don't know if Pinwheel Star is the correct name for this quilt block. I just came up with it while playing around with the colours in another block. Right away, I noticed the "pinwheel" in the centre of the block as well as the "star" that forms around it -- hence the name I gave it. This is an easy block to construct because it contains only basic shapes -- the square, half square triangles and flying geese units. If you happen to know if there is an actual name already for this block, please let me know. By laying the quilt blocks out on point or side-by-side, you can achieve two totally different looks for your quilt. 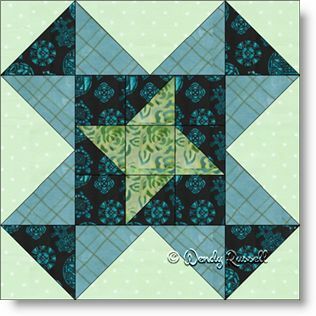 You might also try grouping four quilt blocks together as one, and then play around with those new, larger quilt blocks for a variety of looks as well.